Aggressive DUI, Criminal Defense, Reckless Driving,and Divorce Defense in Virginia Beach and Surrounding Areas | Swango Law P.C. Swango Law P.C. provides focused legal defense throughout the Virginia Beach and Norfolk areas — including Portsmouth, Newport news, Hampton and Chesapeake, Virginia — by an attorney with extensive experience. Our law practice focuses primarily on traffic violations defense, DUI defense and criminal law. We also have a division in our firm that is dedicated to divorce and family law issues as well as personal injury. 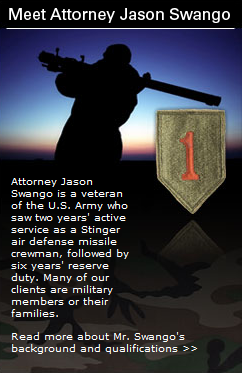 Attorney Jason Swango is a veteran of the U.S. Army who served eight years as a Stinger air defense missile crewman. Many of our clients are military members or their families. Schedule a consultation. Call (757) 383-9229 or contact us online. Traffic violations : Virginia Beach criminal defense attorney Jason Swango handles dozens of traffic violations cases every month, including reckless driving tickets and citations for driving on a suspended license. Mr. Swango also focuses his practice on assisting out-of-state drivers with Virginia traffic citations. DUI defense : We defend drivers arrested for drunk driving, whether it is your first arrest or you are facing a DUI charge as a repeat offender. We aggressively defend DUI cases by challenging Breathalyzer tests and fighting to have evidence dismissed due to violations of our clients’ constitutional rights. Criminal defense : In our criminal defense practice, we handle other misdemeanor and felony cases, such as domestic violence charges, drug crimes, assault, theft and juvenile crimes. Divorce and family law : We handle divorces and child custody disputes, especially military divorces. Bankruptcy : If you need help getting a fresh financial start, we provide advice and file paperwork relating to consumer bankruptcy. We want you to feel comfortable with your choice of attorney. Take time to learn more about our firm and our five-point guarantee system. Or, simply contact us online or pick up the phone and call (757) 383-9229. You’ll be glad you did.